Ryan Barness ’02 analyzes a glomerulus in a kidney cell at Mayo Clinics, Rochester, Minn.
Barness said his professors in the UIU Division of Science and Mathematics went above and beyond to challenge him, and provide him with help if he needed it. Their obvious love of learning encouraged him to keep learning himself, he added. Continuing education was one of the deciding factors when he considered Mayo Clinic for a career. During Barness’ senior year in molecular genetics class, he traveled with his classmates to the Mayo Clinic to tour the cytogenetics laboratory. He learned that if he got hired at the world-renowned clinic, he could also continue his education. He is currently working on his master’s degree in molecular neuroscience, all while conducting research that could potentially have a positive impact on the lives of millions of people world-wide. Barness admits that he wasn’t the typical biology student on a trajectory to work in such a prestigious setting. In fact, Barness came to Upper Iowa as an undeclared student, and was on academic probation after his freshman year. Then, he cracked open an advanced chemistry book. What he found inside interested him and he decided to test the waters with a botany class and biology. The more he learned, the more he wanted to learn, and his Upper Iowa professors were more than helpful when it came to providing Barness and his classmates with more information. As he progressed into upper level biology and chemistry classes, he did better in school, and it wasn’t long until he was on the dean’s list. At Mayo Clinic, Barness is on the cutting-edge of research. He is involved in validation studies to develop a protocol to treat platelet disorders, such as Hermansky-Pudlak Syndrome, and is part of the renal team studying diseases associated with the kidney. “There is a controversy over what a dense body and an alpha granule are in platelets,” he explained. 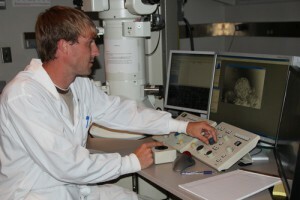 “Our research team is trying to validate that by doing x-ray microanalysis. When he thinks he’s located an area of interest on the sample that could aid in a diagnosis, he sends an electronic image of the area to the pathologist. His attention to detail and careful analysis pay off. Just recently, Barness analyzed five glomeruli in a kidney cell and on the very last glomerulus, in a very small section, he found tiny immune deposits. The pathologist called him personally and thanked him for his hard work. “You can miss it by just that much,” he said. Dr. Jeffrey Salisbury, Mayo Clinic professor and director of the Electron Microscopy Laboratory, stated, “Over the past five years, Ryan has become a key player in electron microscopy at Mayo Clinic. He is skilled in processing tissues and cells; taking them form the living state to the point where they are embedded in plastic that can be cut with a diamond knife to a slice only a few molecules thick.